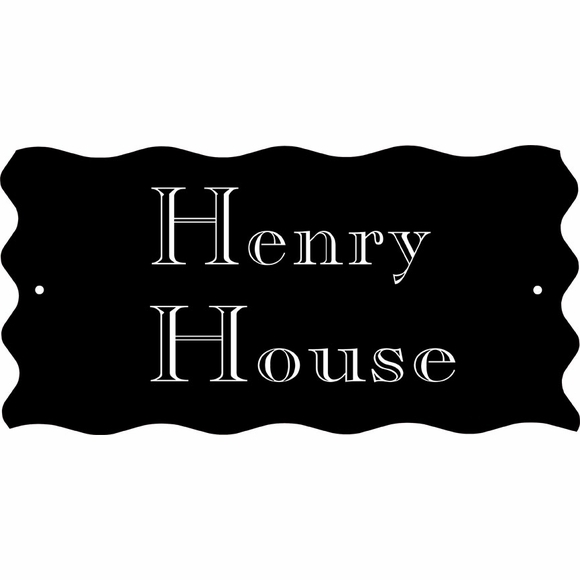 House Name Sign - - personalized plaque for a landmark building, historic house, or any house identified by its name as well as its address. Made in USA. The unique shape of this wave edge house name plate along with the stunning engraved font will endow your home with special status in the neighborhood. Wall mount house name sign features scalloped edges and is customized with one or two lines of up to eight (8) 2" characters per line. Note: if you are only using one line, please leave the Line 2 input box empty. Made from sturdy and UV-stabilized laminated acrylic with engraved characters. Dimensions (approximate): 12"W x 6"H x 1/8". Personalized house name. Intriguing scalloped edge design. Crafted in the USA by skilled artisans to assure the highest quality.